Efficiency - Each starter pack includes four sizes of pipettors enabling volumes from 0.5uL to 1000uL, a pipet stand, and a full box of tips for each size! That's 36 racks of tips... enough to really get work done. Savings - Four high performance pipettors, the stand, and tips for less than normal price of pipettors alone! 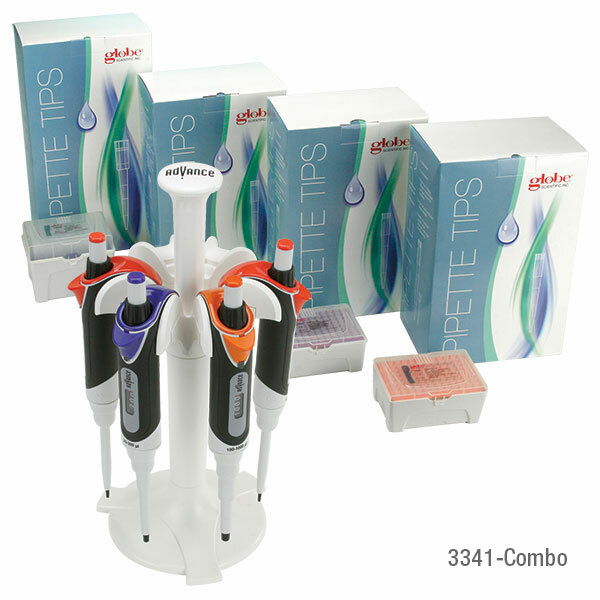 Choice - Starter packs are available with either Diamond Advance™ Ultralight High Performance Pipettors or Diamond Pro™ High Performance Pipettorsto meet nearly all performance needs and price points. Quality - Starter packs include Globe Scientific Certified pipette tips that are certified sterile, RNase, DNase, Pyrogen, DNA, and PCR inhibitor free... making them suitable for the most critical research. Accuracy - Pipettors are calibrated in an ISO 17025 accredited laboratory and both Diamond Advance™ and Diamond Pro™ pipettors have padded handles to reduce heat transfer for consistant accuracy.